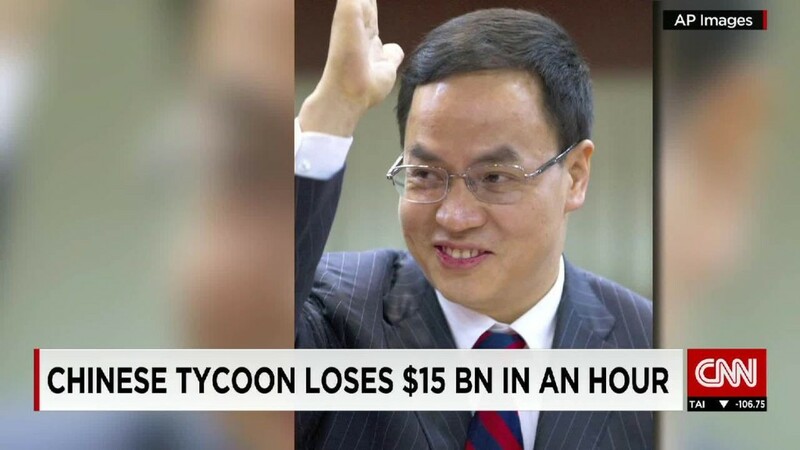 China's richest man, Li Hejun, is having a really bad week. The chairman of solar panel firm Hanergy (HNGSF) lost $15 billion on Wednesday when shares in the company plummeted 47% in Hong Kong trading -- in about an hour. The company saw $18.6 billion wiped off its market value. Trading in Hanergy shares was halted Wednesday pending release -- the company said -- of an announcement "containing inside information." The company has not commented further since, and the shares are still suspended. Li owns just over 80% of Hanergy. He failed to show up for the company's annual shareholder meeting on Wednesday, which began as the shares were plunging. A company spokesperson said he was attending the opening of Hanergy's clean energy exhibition in Beijing instead. The lack of a company statement is adding to the confusion surrounding the stock crash. Bespoke Investment, a New York research and wealth management firm, called "the Hanergy story a complete mess." And there was another mystery crash in Hong Kong on Thursday. Goldin Financial and Goldin Properties, owned by billionaire Pan Sutong, nosedived more than 40%. Both companies said they had no idea why their shares were plunging, and that they had no information to disclose to investors. Like Hanergy, the two companies had soared to astonishing highs over the past year. Investors, regulators and analysts have questioned Hanergy's rapid share rise, and how the company was turning a profit, for months. They've used the company as an example of the risk of investing in emerging markets. Before Wednesday's plunge, Hanergy's shares had surged 625% over the past year, making it seven times bigger than First Solar, the top U.S. solar firm. At its peak in April, the company was worth more than $45 billion, allowing Li to overtake Alibaba co-founder Jack Ma as China's richest man, according to a ranking by Hurun released in March. But the huge climb spurred questions over market manipulation. And more concerns were raised earlier this year, when the company said 60% of its sales came from its Beijing-based parent company, Hanergy Holding Group. Li is also chairman of the parent. On Wednesday, Reuters reported that the Hong Kong Securities and Futures Commission had been investigating market manipulation for weeks, citing an unidentified source. In recent months, the Financial Times has reported on Hanergy's accounting practices and unusual price movements. Hanergy uses a specialized technology to create thinner, more flexible solar panels. The company has 15,000 employees, and branches around the globe.